I have always admired traditional dresses. Especially the ones from Indonesia. They are always full of colors and panache. They have unique symbols and designs. Colors often denote functions and status in society, the same also can be said about the accessories. 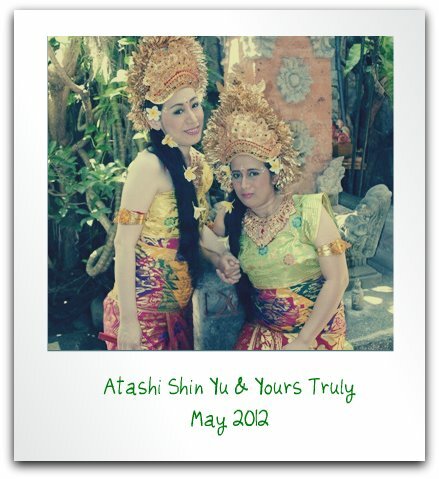 Last May, my best friend and I thought that perhaps it'd be nice to dress up, Balinese style. We went to a photo studio specializing in this kind of thing. IIRC we had to pay IDR 350,000 for one person. Each will get five printed pictures in postcard size and a CD of raw pictures (they normally take about 3 pictures in one pose). The price includes make up and costume rental fee. 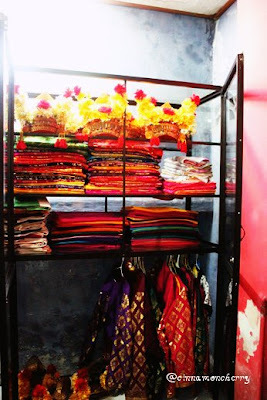 We were amazed to see their collection of costumes and headdresses. So many colors! I let them choose the colors and style. They told us they'd dress us in Putri style. They picked some long cloth and wrapped it around me. You really need to have someone else around to help, when you want to get dressed in this way! One thing for sure, the headdress is very heavy! It left some marks on my forehead. Surprisingly, it didn't take very long for them to put on the clothes, accessories and make up. Maybe around 20 minutes or so. We took the pictures some time in the afternoon. We got the results at night. You can see one of the results here. Gosh, we look so different! But it was certainly fun. Once upon a time, it was always nice to play dressing up as princesses. And one day, looking back, memories will flood your senses and you'll sigh, "Oh, those good ol' days." Thank you, Nina Higa, for taking the time to make some memories with me that day.